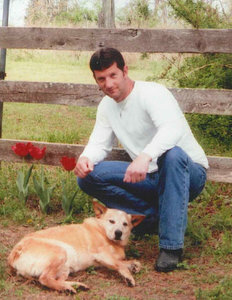 Graveside services for Nicholas (Nick) Heath Hudlow, 39, Caulfield, Missouri, will be held at 2:00 p.m., Saturday, February 16, 2019 at the County Line Cemetery near Bakersfield, Missouri under the direction of Robertson-Drago Funeral Home. Nick passed away at 11:03 p.m., Saturday, February 9, 2019 at the Ozarks Medical Center. He was born March 28, 1979 at West Plains, Missouri to Eugene Murl Hudlow and Beverly Kay Morris Hudlow. For several years, Nick was employed as a boilermaker; a job he very much enjoyed. He loved the out of doors, hunting arrowheads, and floating the river. Nick lived life to the fullest, greeted everyone with a big smile, firm handshake or a hug; he had a special love for his mom and dad. He is survived by his parents, Gene and Beverly Hudlow, Caulfield, Missouri; his uncles and aunts, Harold and Lyndal Morris, Gamaliel, Arkansas, Larry and Catherine Morris, Caulfield, Missouri, Steve and Jeanna Morris, West Plains, Missouri, Darrell and Paulette Morris, West Plains, Missouri, Kay and Tony Liggin, Locksburg, Arkansas, Larry and Joyce Tilson, Tecumseh, Missouri, Bobbie Jack Tilson, Andover, Kansas and Betty and Loyd Robinson, State of Illinois; many cousins; and his dogs, Buddy and Rascal that were special to him. One uncle, Doyle Morris and one aunt, Edna Marie Vann, preceded him in death. Visitation will be from 6:00 until 7:30 p.m., Friday, February 15th, at the Langston Street Chapel of Robertson-Drago Funeral Home. Memorial contributions may be made to the County Line Cemetery and left at Robertson-Drago Funeral Home. Beverly and Eugene, I am so very sorry for the loss of your son. You will be missed greatly Nick!! He had a heart of gold!! Rest in Peace friend….I will always remember how you us to sing on the school bus when I was just a small child. Lord, please send love and strength to his family during this sad situation. Beverly and Gene we give you our respect and love. Rest in peace brother. I am very sorry to hear about this tragedy. Nick will be missed by all that knew him. If anyone needed a helping hand, Nick would do whatever he could to help them. Nick had a heart of gold. Nick had a smile and a laugh that was priceless.. May God give peace to his parents and his family and friends. Nick you will never be forgotten and you will be greatly missed and your smile will be a constant reminder to enjoy life to the fullest. See you on the other side love ya buddy. Bev and Hud my heart is so sad for you. This is devastating. All of heart love and prayers go out to you both. He will be greatly missed. RIP Nick thanks for the memories. They will be forever cherished…. You are both in our thoughts and prayers. May God sustain you during this very difficult time. Nick was one of a kind, so loving and full of life. i will always remember him coming to Ryan’s with his mom after church on Sundays. I always looked forward to seeing the 2 of you, Nick had a great big smile every time. genuinely happy to see me. I am so very sorry for our loss. Nick will be hugely missed. Prayers for you Bev, and your whole family. My prayers are with you. It is so very hard to loose your child. I know what you are going through. Nick was such a sweet person and I loved visiting with him everytime I ran into him. He always had a hug and a smile. Peace be with you knowing that he is at peace. My family and I would like to send our condolences for your dear loss. Loosing a child can be very difficult. So our want to take this time to extend our sorrow. May your family find comfort and hope in God’s promise for a better future. Where there will be no more sickness, sorrow, pain or death. These promises are found in God’s word the Bible. Scriptures such as Revelation 21:3,4 and John 5:28,29. May reading these scriptures soothe your aching hearts during this most difficult time. Please be assured that your family will be in our thoughts and prayers. Beverly and Geno I was sorry to read about your loss of Nick. He always made me feel welcome when I would come to visit and I will miss him very much. May God hold you both in the hollow of his hands during this difficult time. Oh no Beverly, I didn’t know.. I’m so sorry you lost Nick, my heart feels for you and my prayers are with you and Hud.. I remember when you were pregnant with him and how sick you said you felt.. I know GOD will comfort you at this time and I hope and pray that you and Hud feel the comfort of all who wrote here that love and care so much for you as I do. If there is anything, anything at all that we can do to ease your suffering please please let us know, ok ? I love you Beverly and I’m so so sorry.